The Moen sink faucet in our black bathroom (so named because of its black tile, white trim, and gray floor) began piddling a few days ago, which seemed odd: Moen says it has a good-for-your-lifetime ceramic valve. So I took it apart, extracting an impressive vector of internal parts in the process. There’s nothing about turning / unscrewing the transparent (looks black here) shell around the stem, so I didn’t try. Putting enough of the parts back together to keep the cartridge from blowing out in my face (even if I can’t remove it, it’ll certainly blow out on its own), the faucet valve worked fine. 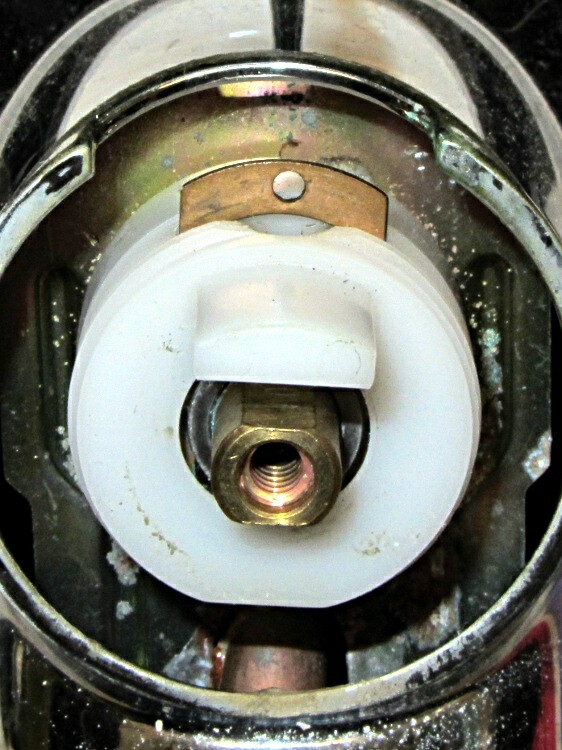 You’re supposed to turn the gray pivot retainer 1/4 turn beyond hand tight, which compresses a wavy washer under the retainer. 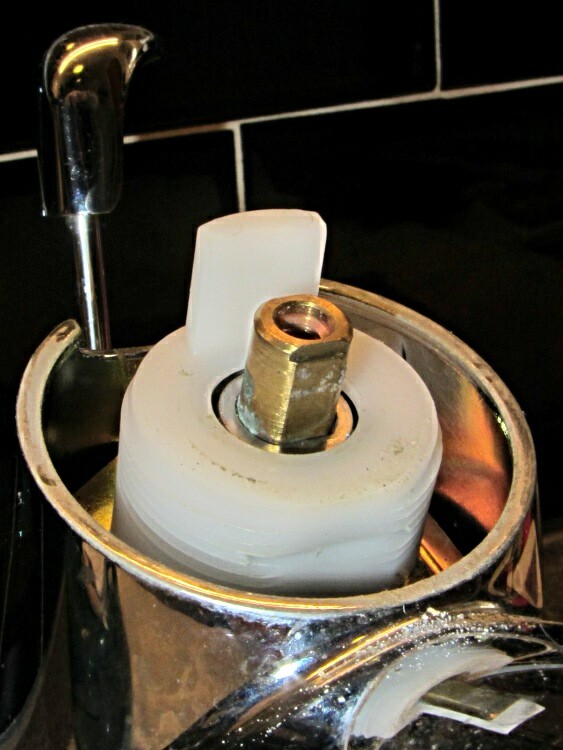 The retainer had been quite loose when I dismantled the faucet, which suggests that either it hadn’t been tightened at the factory or had worked itself loose. That would tend to hold the handle up just a bit, perhaps enough to prevent the valve from completely closing. After snugging that retainer down tight and reassembling everything, the faucet worked perfectly: happy dance! Cleaned that out and it’s all good again. This entry was posted on 2011-11-27, 07:07 and is filed under Home Ec. You can follow any responses to this entry through RSS 2.0. Both comments and pings are currently closed. I’ve had luck soaking faucet guts in vinegar overnight — suddenly everything works again. The hot/cold antiscald valve in the shower seized, and once I dug out the cartridge and soaked it for a while it was happy again. Add 2 tablespoonful of baking soda and children clap their hands. Works for me, too, despite the fact that the water is allegedly softened to a fare-thee-well. 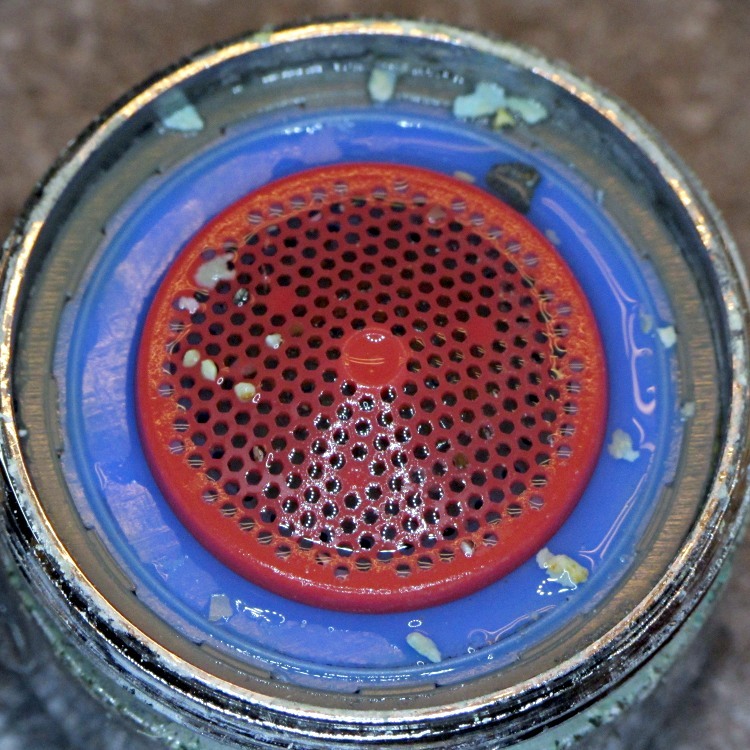 The mineralization must be something else, but whatever it is that accumulates inside the kitchen spout responds well to acetic acid. 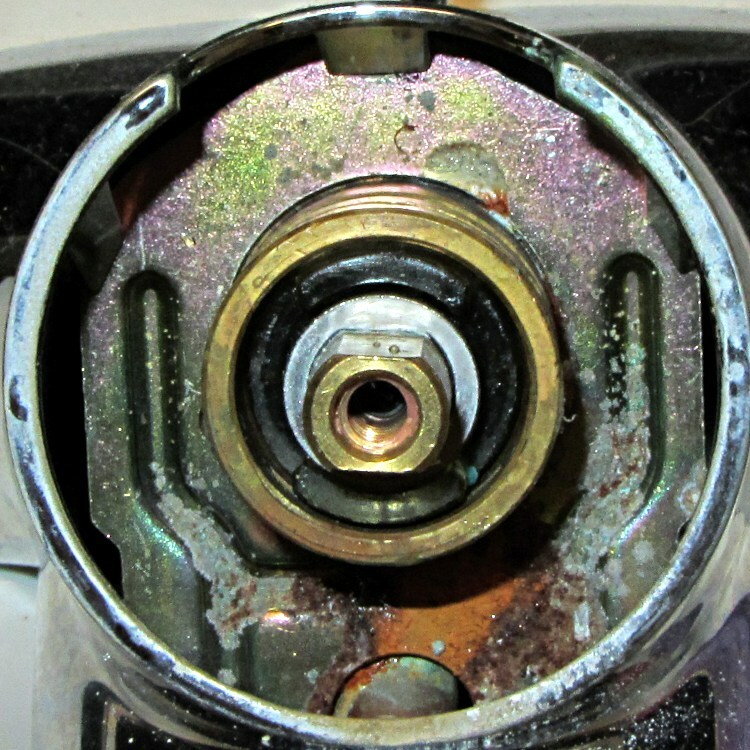 My buddy dBm calls such fixes “zero-dollar repairs” and we all agree they’re the best kind!